Open Orthodoxy is a stream of Orthodoxy that combines a strict adherence to Jewish law with an openness and flexibility on certain contemporary issues, like for example, women's inclusion in the Orthodox tradition, interaction with members of different faiths, interaction with members of different denominations of the Jewish faith, and an openness to creative and non-traditional interpretations of Jewish texts. 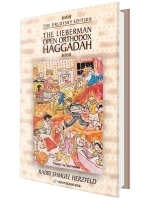 The Open Orthodox Haggadah touches on a number of the hot-button issues of the day in the Orthodox community such as, kol ishah (may a woman sing in front of men), what is the proper way for a woman to immerse in the mikvah when she is converting, should every synagogue have a maharat (a female member of the clergy), as well as innovative readings of the Exodus story. The Haggadah includes guest voices from prominent and original thinkers. Rabbi Asher Lopatin, President of Yeshivat Chovevei Torah, analyzes the passage, Pour out Thy wrath upon the nations. Michel Martin, of NPR, shares her perspective on what it is like to purchase the chametz from the Jewish community every year. Maharat Ruth Balinsky Friedman offers a call to include in our Seder narrative the voices of couples dealing with fertility challenges. And Rabbi Avi Weiss, the originator of the term Open Orthodoxy, offers an introduction to the principles of Open Orthodoxy as well as an essay on why Yitzchak is described in the Torah in language that is similar to the way a person with Down Syndrome is described. Shmuel Herzfeld is Rabbi of Ohev Sholom-The National Synagogue in Washington, DC. He is the author of Fifty-four Pick Up and Food for the Spirit (The Orlofsky Edition).